If you’ve never had Chocolate Ganache before, you need to! 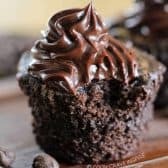 It is a lush, rich and chocolatey dessert topping that sounds fancy and tastes fancy… but the great thing is that it’s so easy to make! Heat heavy cream to boiling. Pour over chocolate chips and let sit for 4 minutes without stirring. Whisk until the mixture becomes dark and thick. Ganache can immediately be poured over squares or cakes or it can be cooled to room temperature and piped.